Tuesday evening I decided that the clear skies demanded that I participate in astronomy in one form or another. Tempted to stay in and rest I finally convinced myself I should go outside. Glad I did. Tracking was right on! This image of the Pelican Nebula was taken in Ha thru my AstroTech 66mm ED telescope piggybacked on top of my Orion 80ED. It represents 50 one minute exposure combined, processed in MaxIm DL/CCD and Photoshop. Initially I was imaging part of the North American Nebula for 30 minutes, then decided to go to NGC7027. 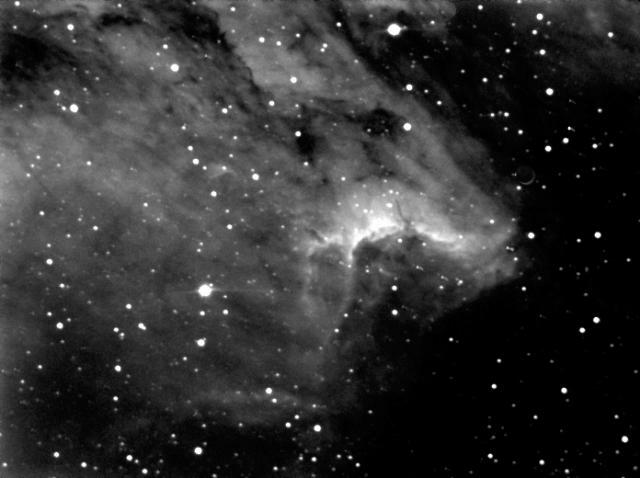 A typgraphical error (IC5067-70) sent the scope to the Pelican Nebula. I always test one 1 min image before proceeding and was surprised to see the Pelican. Naturally this looked better than NGC7027 did so I proceeded with the imaging. I'm happy. Hope you enjoy it. Both IC5067 and NGC7027 are located in Cygnus which just happens to be nearly straight overhead around 10 pm. Hey Gene,,, did you notice the sliver of the moon in the picture?? It is in the top right of the picture righe where the nebulosity ends. It looks like a one day old moon at sunset.